Football legends Ricardo Kaka (Brazil) and Luis Figo (Portuguese) were teasing their arrival in Pakistan for the past few weeks. They have finally landed in the country today. The stars are here to launch the World Soccer Stars (WSS) event. This event is being launched to promote Football in Pakistan. The stars landed in Karachi today and will make a special appearance at the Pearl Continental in Karachi and then will head to Lahore where they will make a public appearance at the Packages Mall. The World Soccer Stars administration has also announced that they will hold two football matches in Karachi and Lahore on the April 26th and 29th respectively. 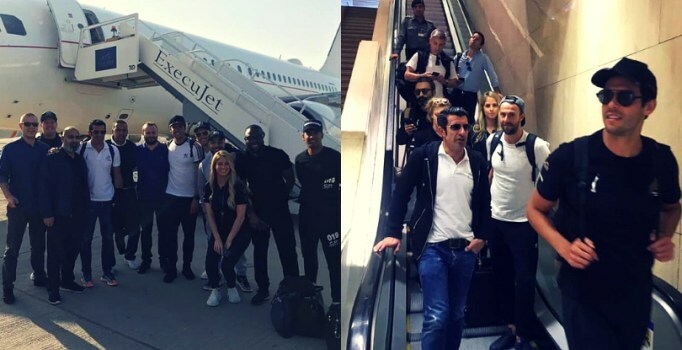 Both Luis Figo and Ricardo Kaka expressed their excitement upon their arrival in Pakistan through their social media accounts. The stars, before arriving in Pakistan, also greeted the Prime minister of the country through a video message, who is also a legendary sportsman. The arrival of the two and the football matches to be held in Pakistan later this year will surely give a much-needed boost to the sport in the country.